It’s been 13 months since your last film Jhummandi Naadam was released? The gap is due to pre-production work for my forthcoming film Uuu Kodathara Ulikki Padathara (UKUP). Tell us about Mr. Nookayya? Director Ani had been following it up for the past 1 year. I loved the story line. I was also offered two other projects - Racha and Naa Istam (from respective directors/producers). I chose to go with Mr. Nokayya. I created my own creative team for Mr. Nookayya. Mr. Nookayya is a commercial hatke film. I am playing the role of a cellphone thief. It’s about a bad guy turning into good. Is it Mr. Nokia or Mr. Nookayya? You will realise it once you watch the film. There is a proper justification to it. What do you think are going to be positive points of Mr. Nookayya? Songs, action sequences followed by story. Which is your favorite song and what is so special about songs of Mr. Nookayya? Pista is my most favorite song followed by title song and oke oka jeevitham. Naveen has cut songs in a highly fashionable style. The choreography and cinematography will also make them special. I am the concept director for Mr. Nookayya title song. We shot each song of this film for not more than 4 days. Each song of Jhummandi Naadam were shot for 7-10 days. But, we made sure that quality of Mr. Nookayya songs is very high despite less number of working days. Pista song was shot in a budget of 18 lacs and you willn’t believe it once you see it on screen. Tell us about various get-ups? They were done for fun and these get-ups come in montage shots which are linked to story. I have also tried different hair-styles in songs. Both Kriti and Sana Khan did well. I would like to thank Kriti for trusting me and doing risky stuff in the film. Your Mr. Nookayya was done in a reasonable budget and your next movie UKUP is a high-budget film? I feel that we should spend money as per the demand of the script. We should go for a limited budget when we try something really different. UKUP is an exception because it’s story demands such a expensive budget and also it features Mr. Bala Krishna in a full-length character. You had stiff resistance when you made Nenu Meeku Telusa? (NMT) Tell us how it changed from NMT to Mr. Nookayya? Those people who felt that I couldn’t pull it off during NMT time are saying that I am doing well now. I have created a good team now and people believe me now. When are you going to do with big directors? My father can get me big directors if I wanted to. But I always want to prove myself. If you look at my sister Lakshmi, she is also doing everything on her own and is traveling a long way. 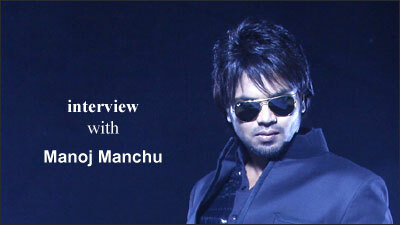 I don’t want to be called as a star’s son, I want to be called as Manoj Manchu. I am in journey of creating a strong identity for myself. You are more inclined towards hard work than smart work? Your PR is also low? I have the worst PR in the entire industry. I work hard and I work passionately. I enjoy the whole process of working hard for something I love and dreamt of. Everything will fall into place if the film is good. I hope that UKUP will make it happen in a big scale for me. Don’t you feel the peer pressure? No. By looking at the selection of scripts, you can tell me that I have no peer pressure at all. I select a script and give my best. My next release is going to be UKUP. I will have another film lined up and that film too is likely to release in this year itself.